Born in 1907, Carl Mydans grew up in Medford, Massachusetts, near Boston. After entertaining thoughts of becoming a boat builder (he spent his childhood on the Mystic River)and then a surgeon, Mydans discovered his true calling while in college at Boston University. While working on the Boston University News as an undergraduate, Mydans' first reporting jobs were for the Boston Globe and the Boston Herald. When he finished college, he went to New York as a writer for American Banker, and then to Washington to join the photographic staff of the Farm Security Administration. In the early days, Mydans would bring a second-hand camera around with him on stories; it soon became clear that he was as talented a photographer as he was a writer. He joined LIFE Magazine as a staff photographer in 1936. When war broke out in Europe, Mydans and his wife, LIFE researcher Shelley Smith, became the magazine's first husband and wife photographer-reporter team to be sent overseas. Constantly traveling Mydans' work took him to Britain, Sweden, Finland, Italy, France (when it fell to the Germans), China, Malaya and the Philippines, where he and his wife were captured by the Japanese. On these perilous journeys, Mydans experienced first-hand the ravages of World War II and the Korean War. The Mydanses were held in Manila for almost one year after the Japanese invasion in 1941; they were then transferred to Shanghai, China, where they were held for another year before being repatriated in a prisoner-of-war exchange,finally arriving home in 1943. Mydans was subsequently sent back into war in Europe for the battles of Italy at Cassino, Rome and Florence and the American-Free French invasion of southern France in August, 1944. The following year saw him back in the Philippines covering General MacArthur's landing. 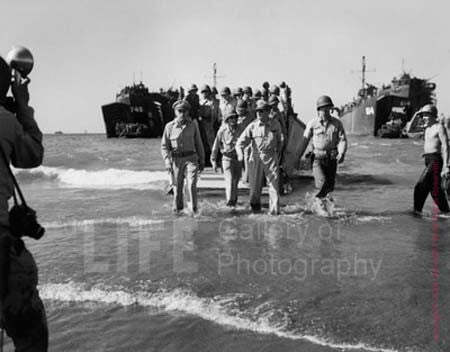 One of his most celebrated shots was of this famous commander reappearing at Luzon, the general's stoic figure-signaling the long-awaited end of fighting in the South Pacific. Mydans' willingness to plunge into the heart of any international drama, no matter how fraught with danger, was evident in his literally earth-shaking coverage of the 1948 earthquake in Fukui, Japan. By then head of the Tokyo bureau, Mydans was the only reporter on the scene when the tumultuous quake flattened the city, resulting in 1,600 deaths and over 10,000 injuries. His incredible images and descriptions of the event as it happened, with billowing clouds of smoke and buildings sliding down like sand castles, gave the world its first and only view of this powerful and tragic event. Mydans again covered General MacArthur's forces during the Korean War. In these photographs, the focus is not on the grandeur of generals but on the diurnal triumphs and hardships tirelessly endured by the infantrymen and the Korean villagers. Mydans' soul-wrenching images of the soldiers' plight earned him U.S. Camera magazine's Gold Achievement Award. taken in 1954, offers a touching contrast between the squirming, excited royal youngsters in their white clothes, and the long-honed, icy expression lessness of their older royal relatives. A 1950 portrait of Douglas MacArthur, in contrast to Mydans' celebrated military shots, shows the enigmatic general at rest, ruminatively smoking a pipe. Generations of wartime photographers and international correspondents have benefited from the artistic and technical foundations laid by Mydans. The artist was honored in 1991 as the Guest of Honor at the prestigious Visa Pour L'Image event in Perpignan, France, a week long exhibition/conference for top photojournalists and picture agencies worldwide. GALLERY M is proud to exclusively represent Carl Mydans' limited edition and vintage photographs in the Rocky Mountain Front Range and online. View the collection here.